Hearth Room in Wolf Creek Ranch, Utah. 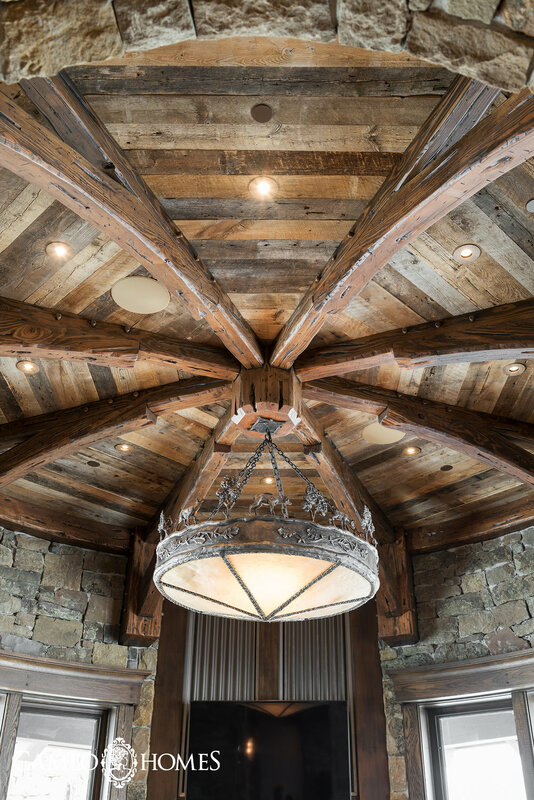 Rustic Chandelier in Hearth Room. 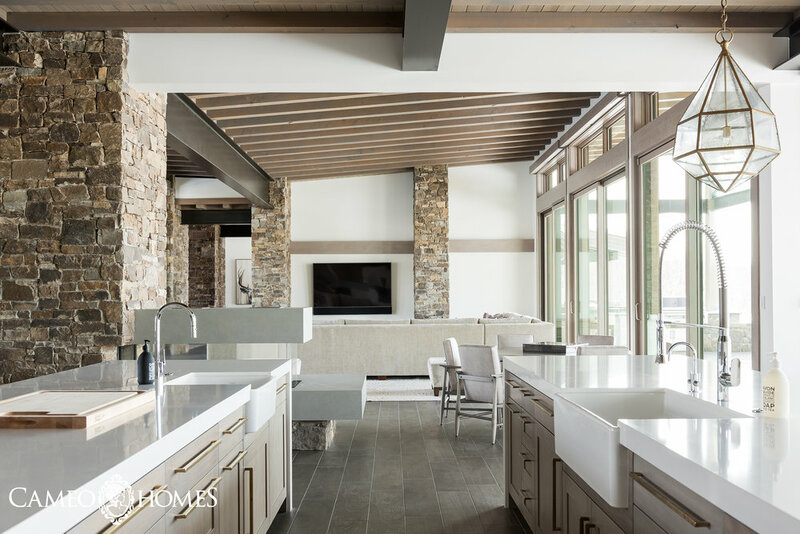 Home built by Utah’s Luxury Home Builders, Cameo Homes Inc.
Take a look at this gorgeous Mountain Rustic Kitchen in a home we recently completed in Wolf Creek Ranch, Utah. This particular home we built in Utah includes a Rustic Bunk Room with 6 custom built Bunk Beds, rustic wood panels, a vaulted ceiling, a sitting area, individual sconce lighting and blue bedding. 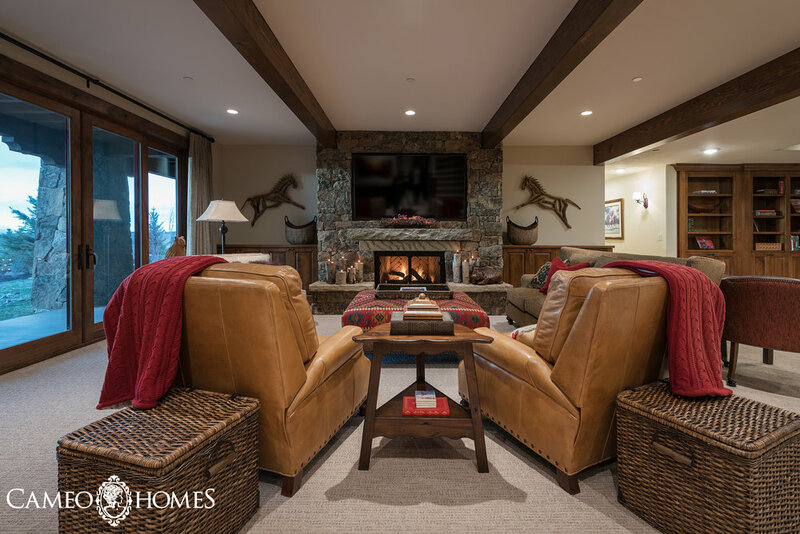 Built by Cameo Homes Inc. in Wolf Creek Ranch, Utah and Designed by Paula Berg Design. Built by Utah’s Luxury Home Builders, Cameo Homes Inc. Designed by Paula Berg Design. Photography by Lucy Call. This might only be a Butler’s Pantry but it demands as much attention as the actual kitchen! 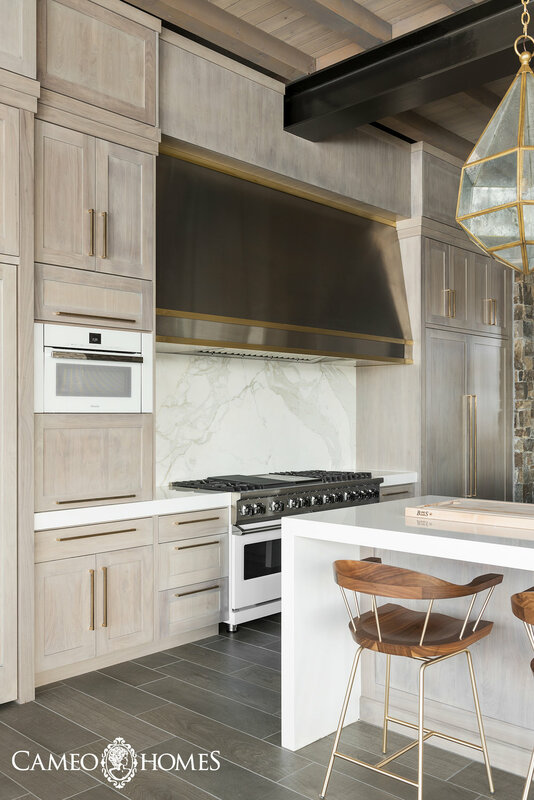 Complete with rich color tones and textures, open shelves, white appliances, walnut cabinets and quartzite counters, this pantry is a real stunner! And to top it all off, the chandelier really makes this pantry pop! Cameo Homes Inc. is excited to share pictures of this recently completed mountain modern kitchen in Wolf Creek Ranch, Utah. 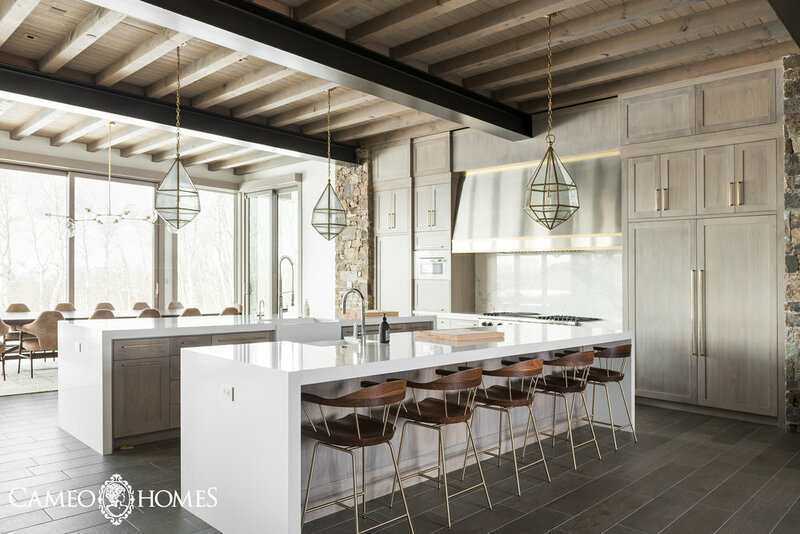 This home was designed by Paula Berg Design and picture credit goes to Lucy Call. 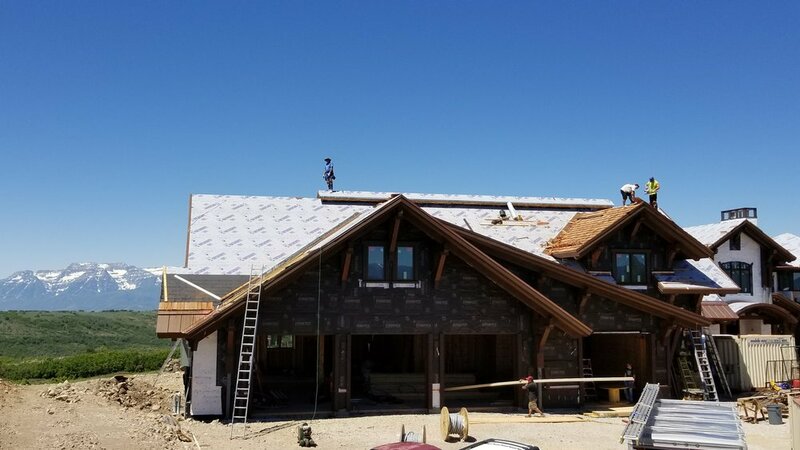 Take a video tour of this recently completed Midway Cottage we built in Midway, Utah. 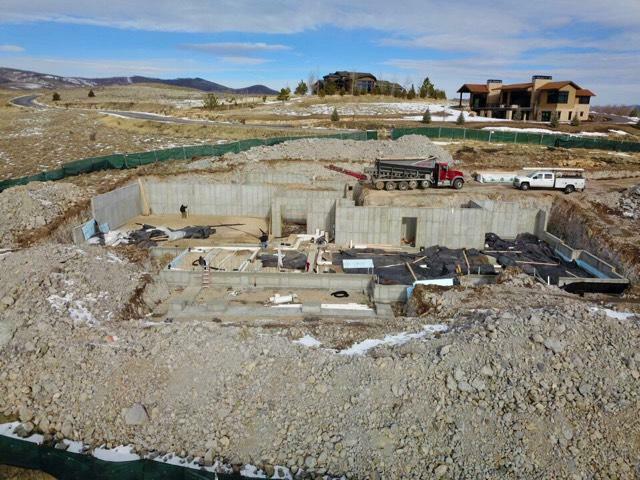 Here are some amazing drone pictures of another Grand Estate we are building in Wolf Creek Ranch, Utah. We are getting excited the closer we come to completion on this home. It's a stunner and we can't wait to show you the finished home! 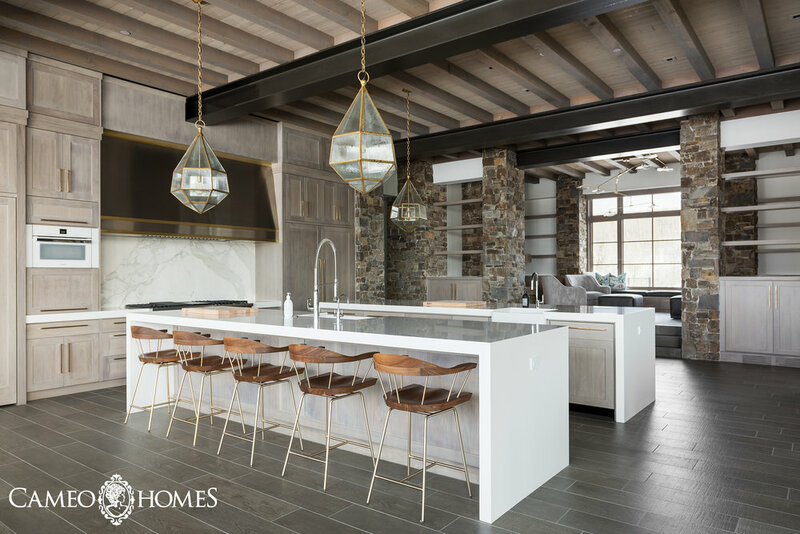 Built by Utah's Luxury Home Builders, Cameo Homes Inc.
Park City, USA, January 17, 2018 – Cameo Homes Inc. of Heber City, Utah has won “Best Of Design” on Houzz®, the leading platform for home remodeling and design. 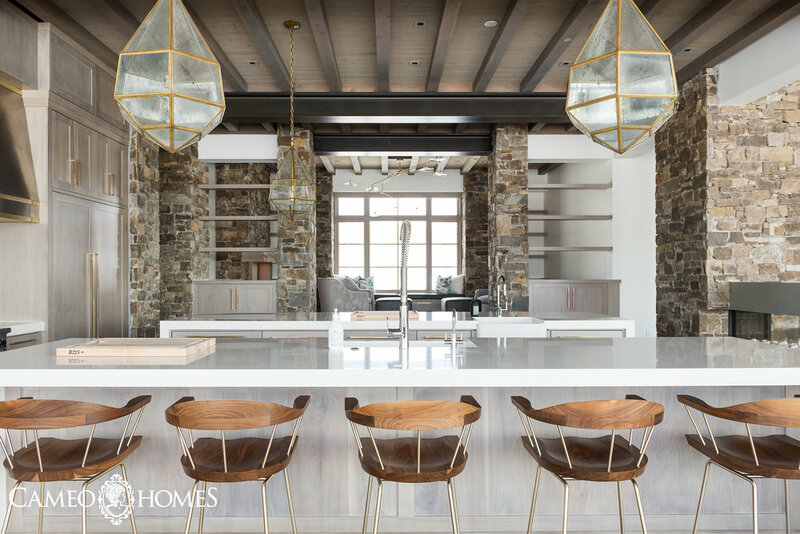 The 41-year old luxury home building company in Utah was chosen by the more than 40 million monthly unique users that comprise the Houzz community from among more than one million active home building, remodeling and design industry professionals. Utah’s Luxury Home Builders since 1976, Cameo Homes Inc. Follow Cameo Homes Inc. on Houzz: https://www.houzz.com/pro/cameohomes/cameo-homes-inc.
Cameo Homes Inc. has been in business since 1976, is family owned and operated by the 3rd generation of home builders. 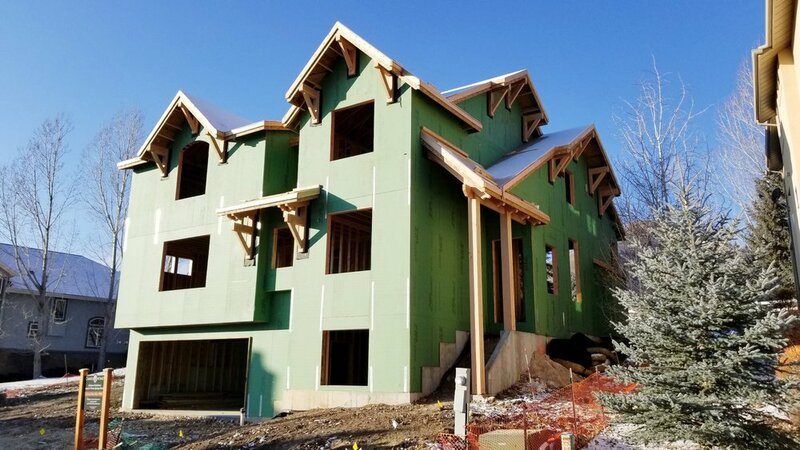 We currently build in the Summit County, Wasatch County and Salt Lake County. Our company is a Licensed B-100 General Contractors providing for Unlimited Residential Size and & Low/High Rise Commercial. Our core concentrations have been Luxury Residential Custom Homes & Residential Development. 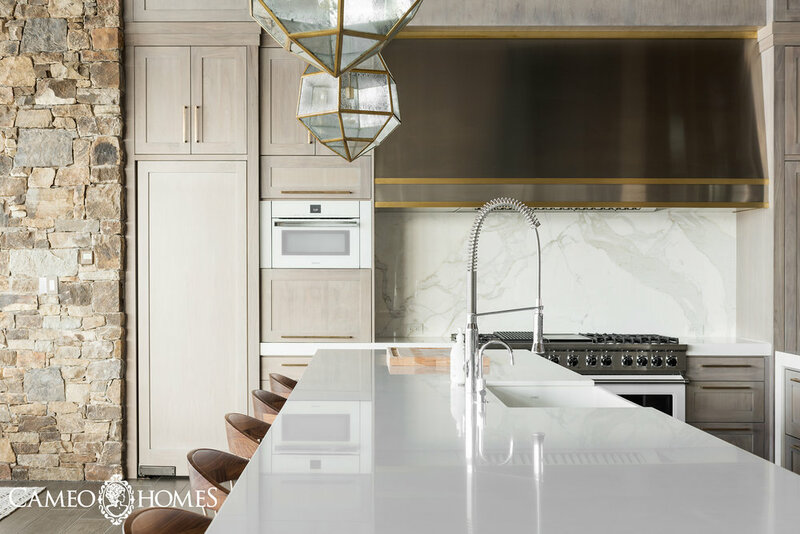 As a Utah luxury home builder and Family owned operation since 1976, CAMEO HOMES INC. has decades of experience building high-quality homes that meet the needs of our clients to the very last detail. We build custom homes in a wide range of budgets – we'd love the opportunity to build yours! 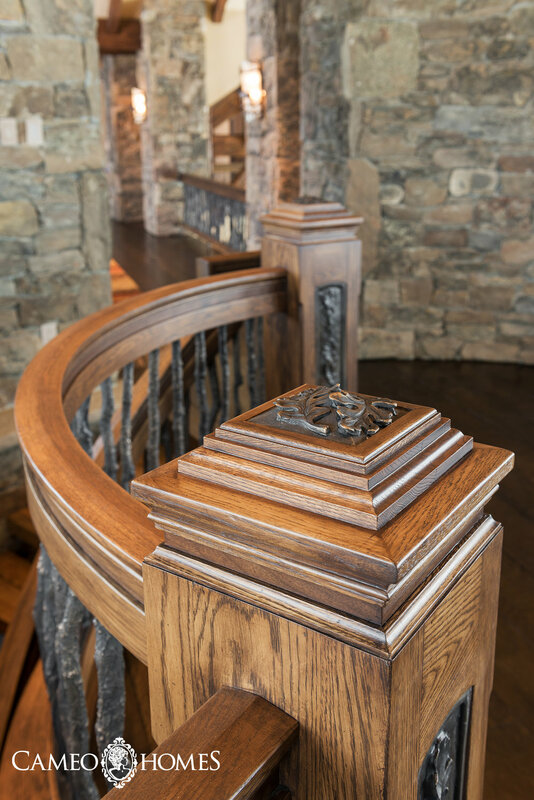 So many grand details to look at on this estate we are building in Wolf Creek Ranch, Utah! Here are a few pictures showing the progress. 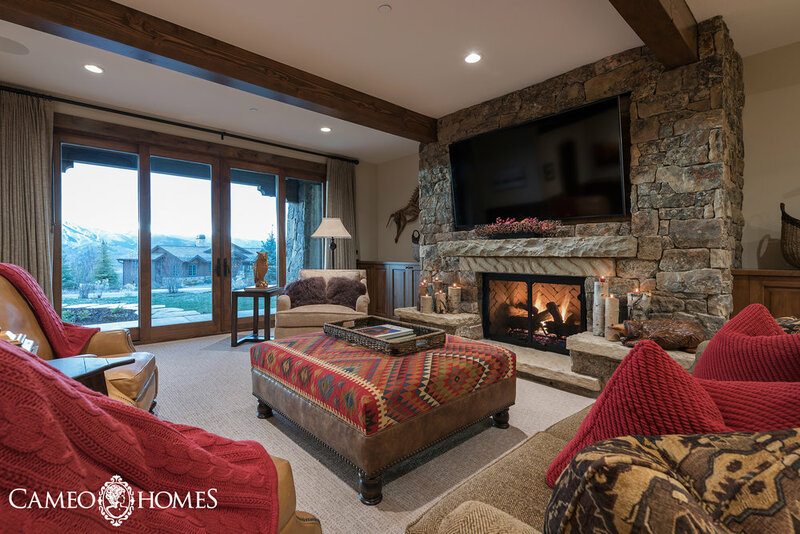 Take a tour of this cozy basement family room in Tuhaye, Utah. This home was built by Cameo Homes Inc. and Interior Design by MHR Design. 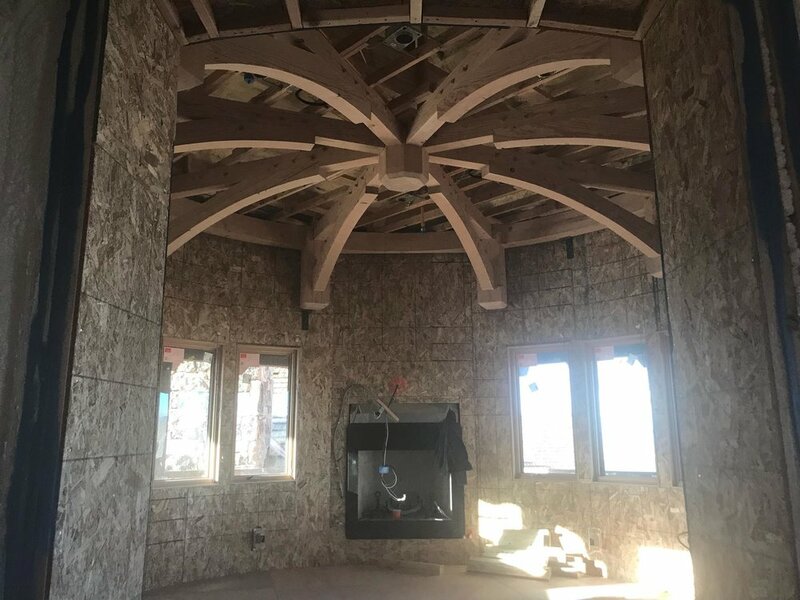 An amazing sitting room in this viewing tower we are building in Wolf Creek Ranch, Utah. 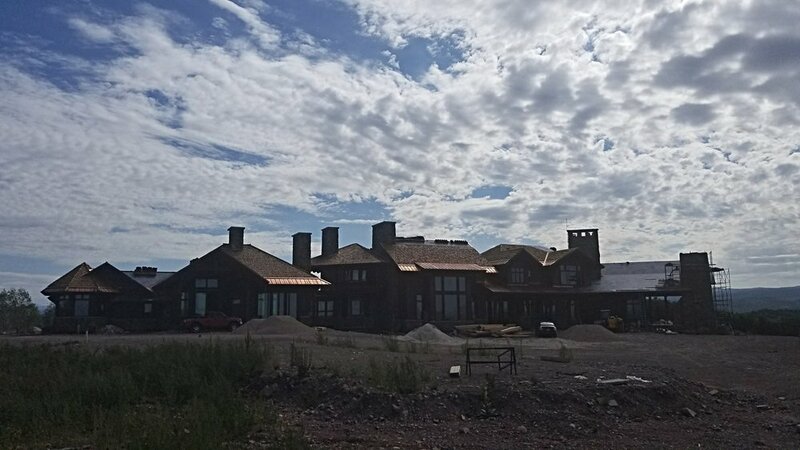 Cameo Homes Inc. had the pleasure of building this luxurious home in Tuhaye, Utah. 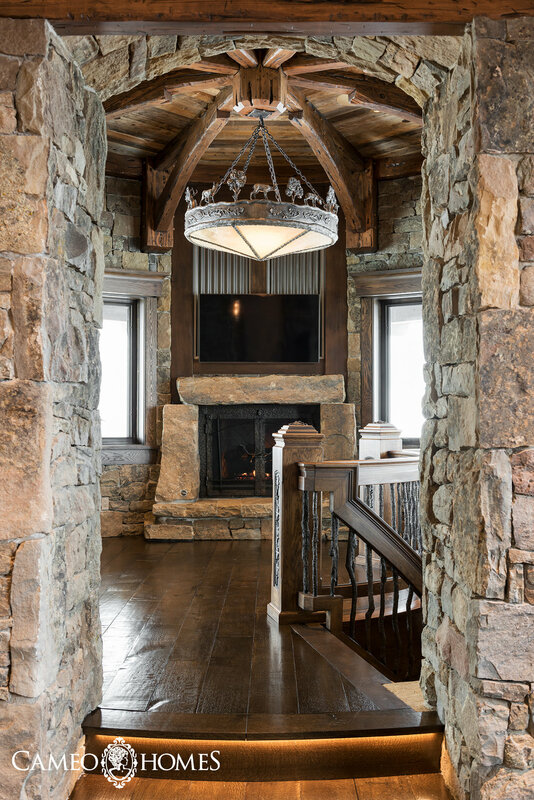 This home was featured in the Park City Area Showcase of Homes. We have had many inquiries regarding this bedroom so we thought we'd show you some more pictures of this Master Suite. 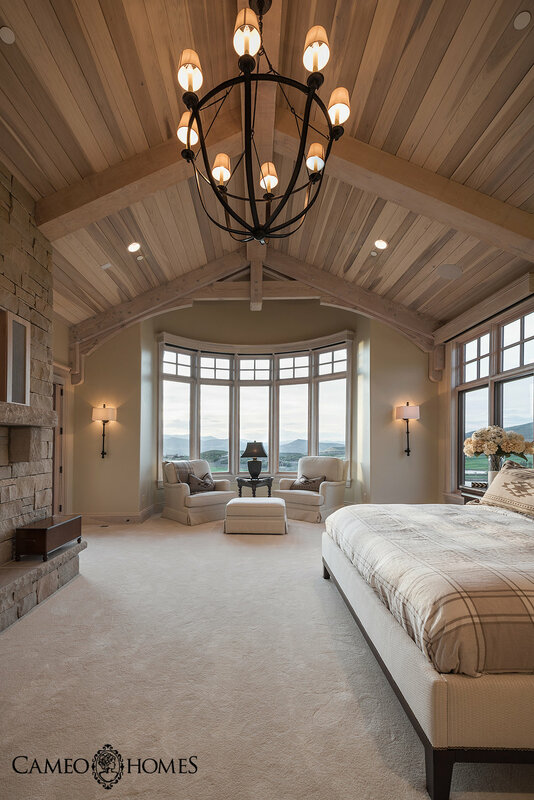 Built by Cameo Homes Inc., Utah's Luxury Home Builders since 1976. Luxury Home Builders Since 1976, Cameo Homes Inc.